Southern end of Station Road, with High Road crossing it at junction. Approx. 1970. Houses and shops still in use, before the redevelopment of the mid 1970s. Ladderswood Estate being constructed. Lee Street on right, with off licence on corner. I lived at 70 High Road which is the shop that can be seen on the right at the end of Station Road. My Dad was Frank Plant and he was a men's hairdresser as was his father Arthur before. Mum did the ladies hair on the first floor and we lived behind and above the shop. My sister and I went to Garfield Road School and Miss York was headmistress. My last year at Garfield was 1954. I left to come to New Zealand in mid 1965 where I still live. My family closed the shop at the end of the same year. I believe we were among the last to leave that block of shops so I don't think any of them would still be operating in 1970. It's nice to see the old place and if anyone has a clearer photo or a photo of that block of shops I'd enjoy seeing them. The date on this picture is out by a good few years. It looks as though Curtis House is still being built here so ~'64 is my guess. 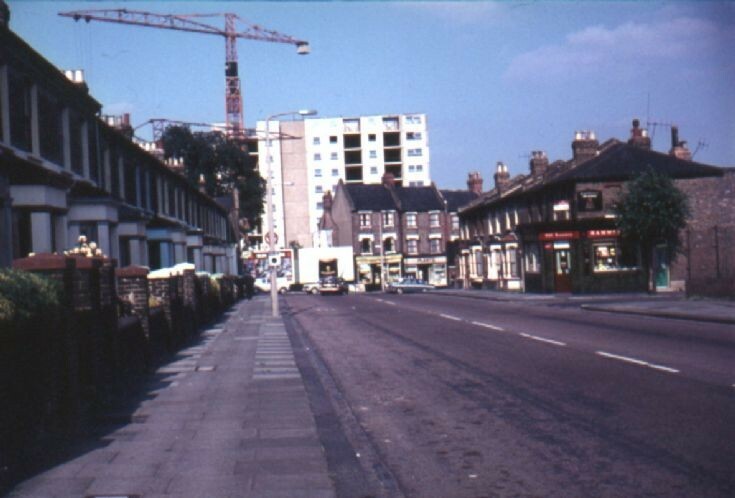 We lived directly opposite the off-licence pictured from 1967 until '71 and the shops pictures were not there although a few still stood further down including a shoe repairer, opposite Albert St, that closed shortly after we moved into Station Road. Very few residents down that end during those years, the off-licence must have closed ~'69 and the adjacent houses were wrecks for a good few years before we left. Most of the houses in Lee St, which ran down to the gas works gates, were vacated and falling to pieces. The area pictured at the end of Station Road here was a playground of rubble sandwiched between billboards and corrugated iron on High St and Curtis House (which was completed in '65 I believe, by the time the 70's arrived. I agree with Lincoln Tomlin here, I was actually born in Curtis House Sept 1969, and I know my parents moved in a few years before prior to my birth.